If you were asked to describe your home school, would you use the words peaceful and joyful? I’m sure that’s what we all hope for our in our homeschools, but often the word stressful is a better description! Do you know that stress free homeschooling is possible? After homeschooling our 8 kids for 31 years, I will be the first to admit that there were many times when things were stressful for me, and the kids could feel it in our homeschooling. 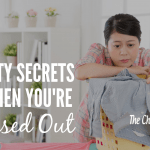 I learned that I had to be careful and intentional in my planning, or it was all too easy to lose the joy and peace in our home school, and live in a chronic state of stress. If you are feeling stressed about things, let me encourage you that it doesn’t have to stay that way! Homeschooling really CAN be (relatively)stress free. 1. Make time for God’s Word. Often when we are overwhelmed, busy, and stressed. the first thing we let go is our time with God. It’s SO easy to let it get crowded out! When we start skipping that time with God, it makes things even MORE stressful. We begin doing things in our own strength and wisdom, rather than seeking HIS strength and wisdom. Everything that we do in our homeschool needs to rest on the foundation of our relationship with the Lord. We need to hear from Him and His Word daily in order to be the moms He wants us to be. If you struggle to find time for God, there are some tips in the previous post: The Secrets To Finding Time For God As A Homeschooling Mom. Make a list of your priorities, and make sure that your daily activities reflect those priorities. If your day gets crazy and you don’t accomplish everything you hoped to, at least you will have accomplished the most important things. Start your day by building your kids faith (Bible reading, and memory), working on character training, and THEN starting on the academics. God will bless your day when you give Him the first part of it, and follow His priorities. Some days you may just need to focus on character, and skip the academics. When you address the heart issues and character problems first, you will then begin to accomplish much more with the academics. Relationships should always trump academics. Don’t let academic struggles strain the relationship between you and your child! When a child is struggling with a subject, try not to get all worked up about it. Eventually they WILL get it. In the meantime you need to encourage and love the child. Don’t let frustration creep in, because your child will sense that and it will hurt the relationship. 4. Teach your children to work more independently. By the time your kids are in 2nd or 3rd grade they should gradually learn to do some of their work on their own. You shouldn’t have to be spoon feeding them at that age. Gradually increase the amount of work they do independently over time. It teaches them to be responsible for their work, while relieving some stress for you! Initially this will take some time and work on your part as you train them in character, initiative, and responsibility, but it is well worth the time you invest! In our zeal to make sure our kids don’t miss out on anything and have lots of opportunities, we can get TOO busy with activities. When every moment of every day is full, it stresses US and our kids. Remember, you can’t do it all, so choose wisely. Prayerfully choose one or two outside activities that you feel are best for your family, and don’t get caught up in the whirlwind of constant activities. Kids need time to just play and explore, and also need to learn to appreciate being home with their family. 6. Leave margins in your daily routine. This is something that I didn’t always do. I tended to schedule things on a tight time frame, and then if one of the kids needed extra help or even just wanted to talk for a minute, I would be short and impatient with them because there was “no time” for that. I had to learn to slow down and allow extra time for everything. Remember that kids usually aren’t in a hurry like us, and just tend to live in the moment rather than rushing around. 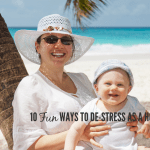 We don’t want to pass our stress on to them by always hurrying them. Things usually take longer than you expect, and there are always interruptions. Allowing that extra time for the unexpected reduces the stress of having to always hurry to stay on schedule. If you don’t leave any margin, you WILL feel stressed and take it out on the kids in the form of impatience. Don’t believe the myth that homeschooling HAS to be stressful. 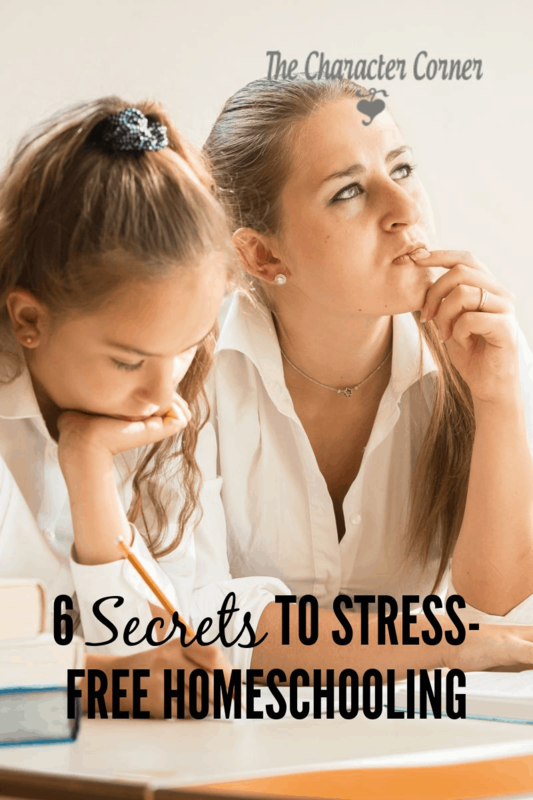 With these 6 secrets, you truly can have a stress free homeschool. 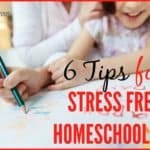 Get 8 secrets to STRESS FREE homeschooling now! This is a fantastic list, Kathie. Even though I am finishing up my 16th year of homeschooling, I still see so many ways I stress myself and everyone else out. I keep pressing on, and trying to learn to relax. Every year gets a bit better. I still have many years to go (my youngest will turn 8 this summer), so I hope that the entire time won’t be characterized by my stress and frustration. Jill, good for you for 16 years so far! I think it’s a personality thing for some of us to be more prone to stressing out, and finding it hard to relax. Glad you are learning, and improving each year. Just think where you will be when you youngest is in high school! 🙂 You will be so relaxed you wont’ remember your “stressed” days.